Microsoft, boosted by the Xbox One X, won the press coverage battle at E3 2017, ending Sony's undefeated streak. 42 energy drinks later: E3 2017 is done and in the rear-view mirror. And as it has the last few years, today, ICO Partners released its annual assessment that looks into which companies generated the most press coverage during the super-bowl like trade-show. 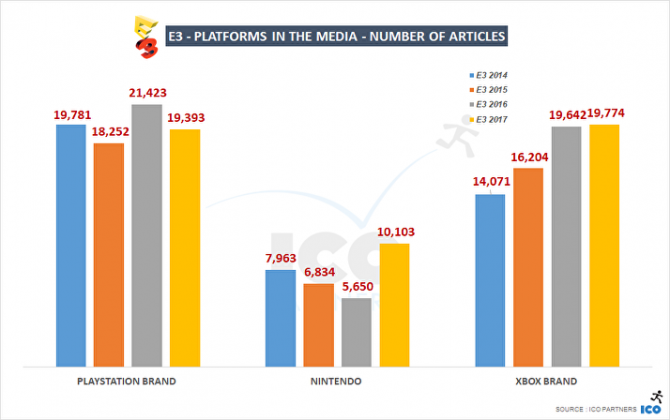 For the first time since ICO Parnters began with this assessment in E3 2014, Sony did not lead press coverage for the show: rather it’s space-rival Microsoft did. Meanwhile, Nintendo had its best E3 performance, doubling the coverage it generated last year, an impressive feat considering its much smaller line-up of games compared to its competitors. As for third parties, ICO CEO Thomas Bideaux noted that Ubisoft was the big winner of the show, gaining a substantial boost in media presence thanks to numerous announcements, the way it went about its business, and of course that big Beyond Good and Evil 2 re-reveal. EA on the other hand had a particularly disappointing performance according to Bideaux, especially with Star Wars Battlefront 2, which wasn’t even the best-covered EA game (outdone by the newly announced IP from BioWare: Anthem). According to Bideaux, EA’s woes could have been a result of the “EA Play Formula” or due to the conference kicking off on Saturday, before E3 really gets into the swing of things. Further, EA didn’t have a show floor booth at the show either. As for games individually, it was Ubisoft’s new entry in the iconic Assassin’s Creed series — Assassin’s Creed Origins — that received the most press coverage during the show, something Bideaux chalked up to it featuring in not only Ubisoft’s conference, but Microsoft’s conference (as well as being playable on the show floor). 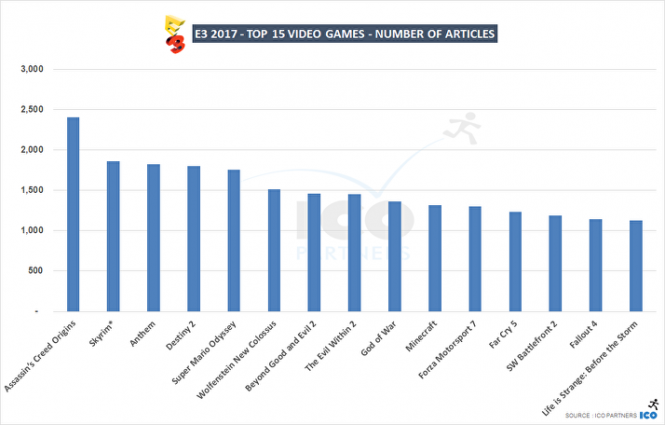 Further, Skyrim was second; however this is a bit misleading as it includes coverage of everything with the name Skyrim in it, aka the upcoming Switch port, Skyrim VR, and the expansion packs for The Elder Scrolls Online and The Elder Scrolls Legends. Rounding out the top-five is Anthem, Destiny 2, and Super Mario Odyssey. 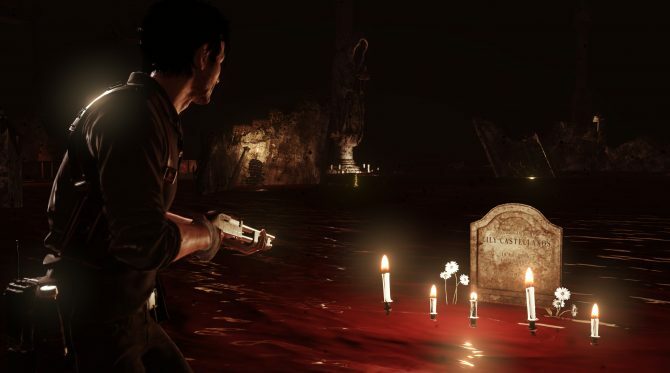 Notably, no Xbox One (console) exclusive made the top 10, meanwhile Sony only ranked with one exclusive in the form of God of War, which came in at No.9. It’s worth pointing out that VR coverage was substantially down year-on-year, with PlayStation VR in particular only garnering half as much coverage. For more details on ICO Partner’s methodology, click here. 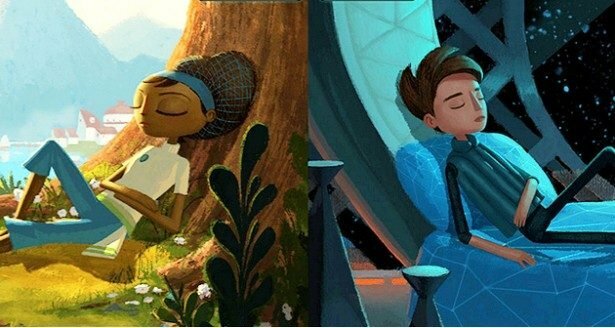 Kickstarter shows increase in funding raised by video games compared to last year even as less games take to the platform.